Sand Dollar Real Estate has been involved in many Surf City, and Island-wide, events over the last 30+ years and when we found out about the “Surf The Sidewalk” event, we could not wait to sign up and be a part of it. Most businesses are running sidewalk sales or having DIY crafts or free samples. We cannot really give free samples of homes, nor have a sale on rental homes, so we are doing the next best thing: hosting a “movie night”. This event will be held June 17th, July 7th, Aug 4th and Sept 1st. Throughout the day we will have freshly popped popcorn and lemonade, as well as a raffle for a family 4 pack of movie tickets (Drawing will be done the morning after event) and there will be a summer long raffle for the AirSwimmer Shark (Drawing Saturday September 2nd). 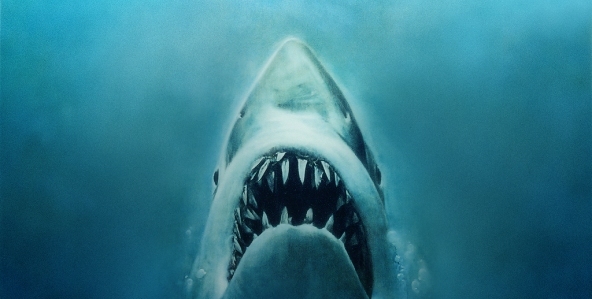 Starting at 8:30pm (weather permitting) we will be showing JAWS in our parking lot; popcorn and lemonade we begin to be served at 8:15, so come early and get your spot and food/drinks. Bring a chair to watch or just stop by for some popcorn and watch a few segments. We will also have glow in the dark wristbands for kids, and those who are a kid at heart. All day and into the evening we will have food, drinks and plenty of information about real estate on LBI. Come take a bite out of Sand Dollar’s cinema event! Not to be topped by our 2015 Trunk or Treat appearance. Fins to the Left, Fins to the Right, Why Don’tcha C’mon by!